Solo practice can be a risky business. Even a three month suspension by a Grievance Committee wreaks damage far beyond the duration of the penalty. Once suspended, solos must inform clients of their status and pass their files on to colleagues. 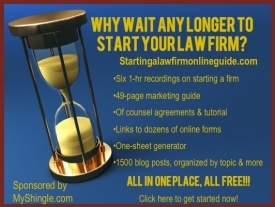 They cannot market and they cannot work on legal matters for other lawyers. When the three month suspension ends, a solo may need double that time to restore a practice to its original condition. So all told, three months suspend means nine months out of commission. If a three month suspension represents the equivalent of a disabling injury, a suspension of a year and a day is a death knell, pure and simple. For that reason, disciplinary committees ordinarily reserve suspensions of this durations for serious infractions that harm clients, such as stealing from trust accounts or video-taping the sexual activity of clients. Not Colorado. There, solo lawyers with otherwise unblemished disciplinary records who win $1.4 million jury awards for their clients and garner compliments on their performance from jurors qualify for sanctions of a year and a day merely for zealously representing their client. That’s what happened to Denver, Colorado solo, Mark Brennan, whose story I last covered in this post. As described in this extensive write up, Brennan ticked off a federal judge during a long-shot employment suit against the City. The judge sanctioned Brennan 75 times during the trial, but apparently, what the judge regarded as uncivil conduct didn’t impact the jury. Brennan’s client prevailed to the tune of $1.4 million. But the judge tossed out the verdict, citing Brennan’s inflammatory conduct in the courtroom. Brennan’s client eventually settled the case for $850,000. Apparently, sanctions, fines and loss of a hard fought verdict wasn’t punishment enough for Brennan, who’d never before been disciplined. Brennan’s case was referred to the state’s Office of Attorney Regulatory Counsel (OARC) which imposed a suspension of a year and day on Brennan for his "obstreperous conduct." The OARC based its findings largely on testimony about Brennan’s courtroom conduct from the court reporter, who presumably, felt compelled to criticize Brennan to stay in good graces with the court, which uses her services. By contrast, the OARC ignored the comments of the jurors, who largely agreed that Brennan had represented his client in a professional, albeit vigorous manner. And while the OARC claimed to give weight to Brennan’s pristine disciplinary record of twenty five years, that consideration certainly isn’t reflected in the harshness of the sanction. To make matters worse, the OARC makes Brennan’s re-entry to the bar contingent on submitting to an Independent Medical Exam. There’s no justification or evidence to support this degrading requirement. In my view, it’s sheer vindictiveness, nothing more. Brennan’s case reflects the darker side of solo practice that few us like to acknowledge, because frankly, it would paralyze us. Sure, we’d all like to think that we’d never act in a way that would generate 75 sanctions, but the truth is, we can never predict how judges will react. Sometimes, judges may simply have a visceral, adverse reaction to certain lawyers or their client, other times, judges may truly be corrupt. In either scenario, judges wield the power to set in motion a case that can end a solo’s career. Just like Mark Brennan. And there’s nothing a lawyer can do to stop it, because inside the courtroom, our fealty lies with our client. We lawyers can’t subordinate zeal to a judge’s demands, no matter what the potential cost may be to our careers. For solos, that cost may be higher. Our profession needs civility, and courts need to maintain order, no doubt. That’s why judges have authority to impose sanctions, financial penalties and contempt order on counsel. But once penalized by the court, as Brennan was (his client’s verdict was snatched away, for heaven’s sake! ), lawyers shouldn’t be punished again with a disciplinary action, particularly one as disproportionate as this one. Unless order is maintained in the courtroom and disruption prevented, reason cannot prevail and constitutional rights to liberty, freedom and equality cannot be protected. Seems to me that constitutional rights to liberty, freedom and equality suffer far more when the OARC shuts down lawyers like Brennan for vigorously and zealously representing their clients. Note: To read a full account of the events leading up to the OARC decision, including some of Brennan’s inside strategy in the underlying federal court case (he’s a really smart lawyer, as shown by his insights, which makes the result even more tragic), I’ll be uploading Brennan’s Valedictory Statement soon (it’s a huge file).